'Bremner's Voice is Dazzling" NOLA Magazine. 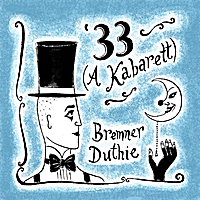 A tribute to Kabarett singers of '20's + '30's Berlin. 12 songs from the Era (+ a modern cabaret song from Sondheim), new arrangements dripping with emotion: longing, irony, cynicism, anger, humor and love. '33 features 13 songs that capture the spirit of these intense times.